Canon claims that its G1 X camera is in a "new category"
Canon believes that there is currently no competitor for its recently announced G1X premium compact camera. 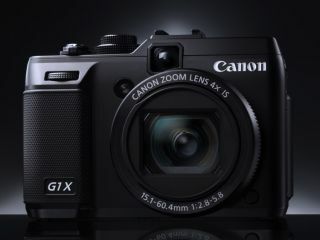 The Canon G1 X was launched during CES 2012 and features an almost APS-C sized sensor and 4x optical zoom. It doesn't replace the G12 premium compact, with Canon instead branding the camera as a new category. Many people were expecting Canon to launch a compact system camera, as it is now the only major camera manufacturer on the market without a model. Its biggest rival, Nikon, was also surprised by the decision to announce a new premium compact. Some now believe that the sensor found inside the G1 X is what will eventually make its way into any CSC it chooses to release, but for now, Canon is maintaining that there is no obvious competitor for the G1 X.
David Parry from Canon UK told TechRadar: "This is a pretty unique camera in the market. If you look at other ones available, you've either got ones with interchangeable lenses, or you've got those with a similar look and design but don't have the zoom flexibility." Perhaps the most likely competitor is the Fujifilm X100, which proved extremely popular. It boasts an APS-C sized sensor, which is bigger than the G1 X's, but it has a fixed focal length lens. The Fujifilm X100 is regularly lauded for its retro styled good looks, but Canon has decided not to go down the same trend. "There are lots of cameras out there that have gone for the chrome look," Parry said, "But we really wanted to stick with a form factor and look that people are comfortable with. "We have to remember that cameras at this sort of level are going to be used by people who see cameras as tools, or use them to get the right image. They don't want to relearn how a camera works." According to Parry, the G1 X has been in development for a long time. "It's been a dream of Canon Inc to actually build a camera like this for quite a while," he told us. "It's finally come around to being produced, and I think we've hit the nail on the head with what we were trying to do, which is SLR style image quality in a compact form." Only time will tell if Canon does eventually relent and produce its own compact system camera, and of course you will find out here if they do.